Consider the following ‘what ifs?’ What if there had been no 20th-century modernism, no Corbusier or van de Rohe, no Gropius and the Bauhaus or, for that matter, no Frank Lloyd Wright? How might 21st-century architecture have turned out? And, what if ‘outsider architecture’ as exemplified in the work of Antoni Gaudí, Freidensreich Hundertwasser, Rudolf Steiner, Buckminster Fuller, Paolo Soleri, Imre Makovecz and Frei Otto, had been more influential, part of the centre ground? Where would we be today? A different place, surely. However, history didn’t play out that way, and the built works of Gaudí, Otto et al are few and far between, a shadow of what might have been, had such a counter-history fared differently. A common characteristic throughout the work of such architects was a certain organic quality remaining radically at odds with modernism’s orthogonal orthodoxy. In the past, and despite organicism’s popularity with the general public, the mainstream has always kept its distance, seemingly unsure about what to do with such outsider quirks in the fabric of its own 20th-century narrative. Today, something of this counter tradition lives on, and every so often a work slips through the net and into the world, at times in unlikely surroundings, summoning the counter-tradition back to attention. ‘There are no vertical walls,’ Olafur Eliasson is saying, during a small press tour of his Fjordenhus project in early June, as I muse on a version of these ‘what ifs’. 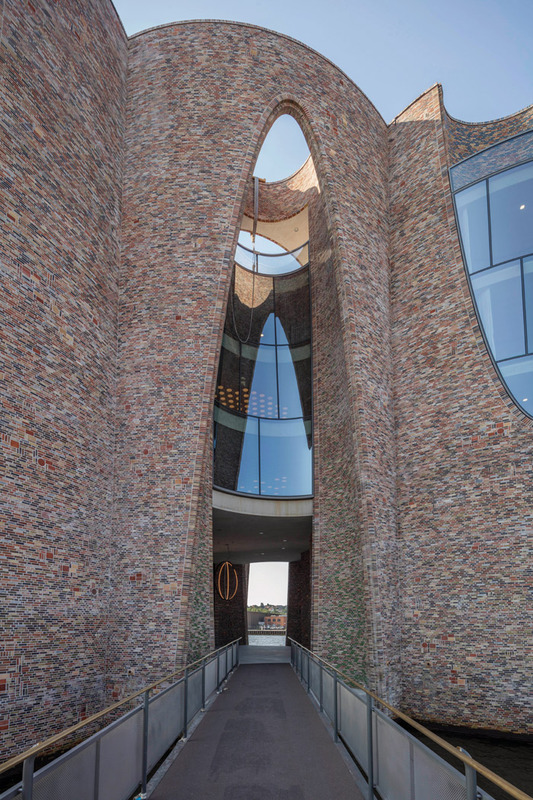 Accessed by a short walkway, Fjordenhus is the first building designed solely by Studio Olafur Eliasson. 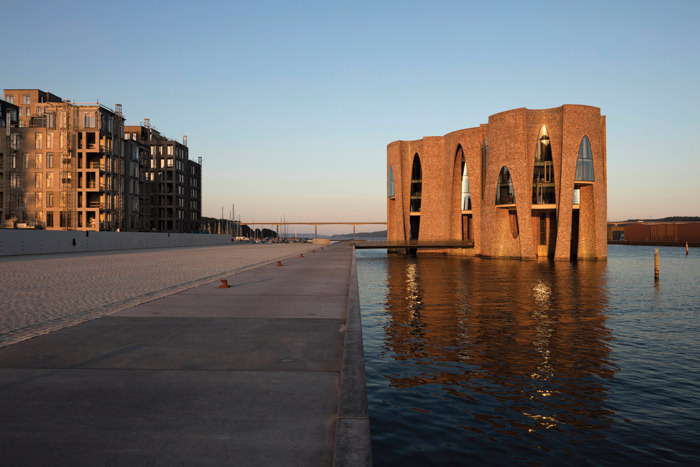 It sits in water a few yards from the shoreline at the far edge of the industrial shipping quarter of Vejle, a Danish town on the Jutland Peninsula’s eastern leeward coast at the end of a long inland bay or, as the building’s name intimates, afford. The north side is in transition; industry half gone, in place a wide square, pile driven into the bay and edged by mid-rise housing, while a long, straight jetty path disappears out into the bay. Masterplanned with long-term Eliasson partner, Zurichbased Vogt Landscape Architects, Fjordenhus — together with the square and parts of the wider development — is financed by Kirk Kapital and affiliates, a wealth fund controlled by three brothers from the Lego family. Fjordenhus itself is the new HQ for Kirk Kapital, and is joined to the square by the short walkway, not entirely unlike a 21st-century castle in the lake. 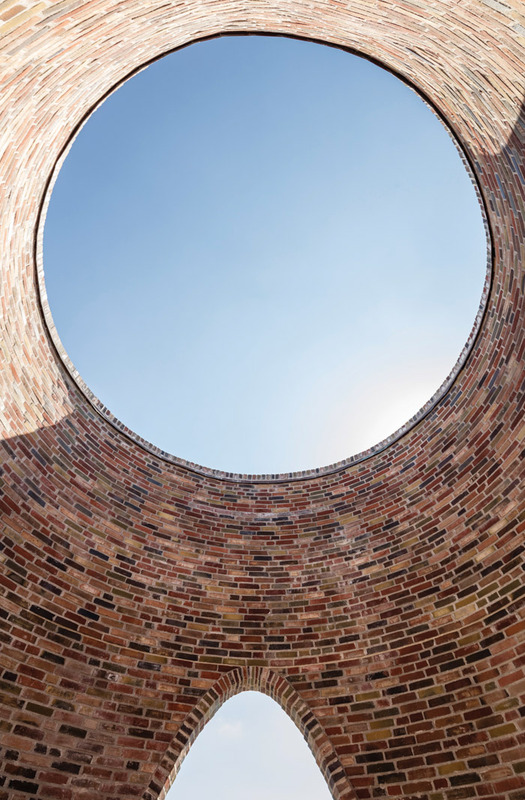 Eliasson emphasises the subtle tilt of the outer brick walls, one element in the emphatically organic, though streamlined and parametrically informed, curvilinear design language. That Eliasson — known for works experimenting with how we perceive and experience space and place — has created a building where the orthogonal has been all but banished feels, if not natural, then hardly surprising. ‘The building celebrates the qualities of the air, the wind, the seasons, the light… and the atmospheric qualities of Vejle, the invisible and non-quantifiable elements,’ says Eliasson. The key is water, he notes, looking down at the eddying whorls splashing against the taut, twisting brick pillars, coiling up from their foundations. 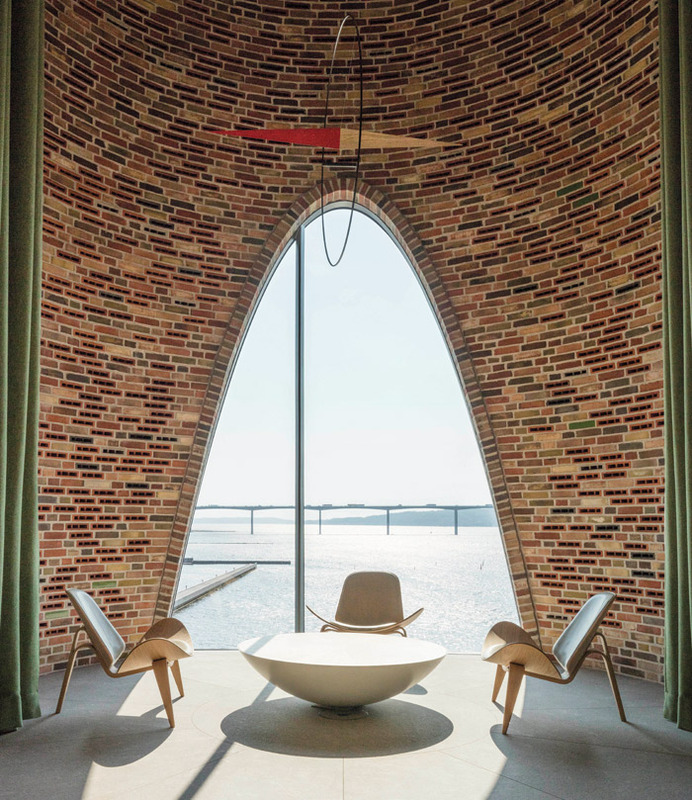 As the first architectural project designed completely by Studio Olafur Eliasson, Fjordenhus fits the narrative of this other, ‘outsider architecture’, to a tee. Comprising four intersecting 24m-wide cylinders, the building’s geometry is based on the circle and ellipse, clearly evident in the irregular curving lines of the individual parabolic arches and windows. Over the walkway, you pass through one of these arches into an open courtyard with new Eliasson artworks hanging from the ceiling. These include Fjordhvirvel (Fjord Vortex) and circular mirror works, reflecting the waters lapping above, as well as below. 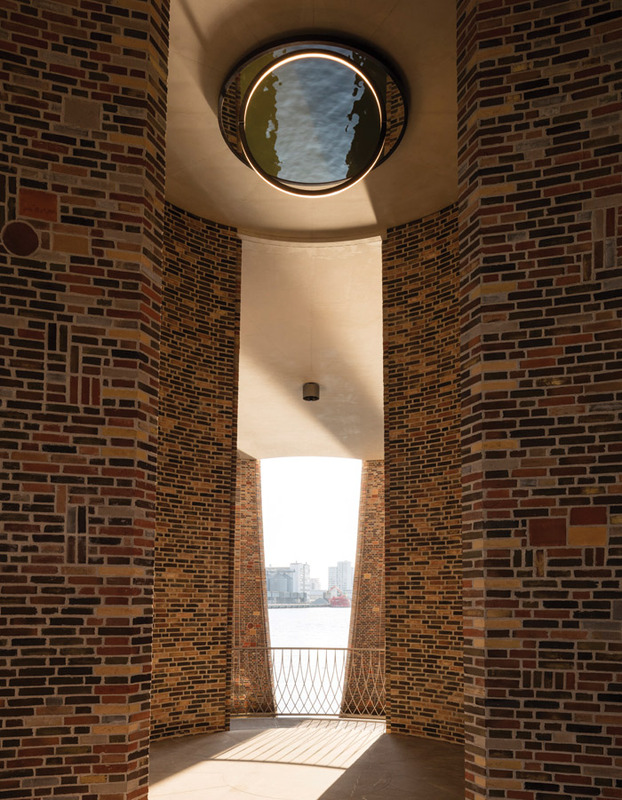 For Eliasson, this publicly accessible courtyard is a shared space, its circular form signalling Scandinavian democratic inclusion, non-functionality, though also the elemental atmospheric conditions. Inside the 28m-tall cylindrical towers, spiral stairwells and lifts access two office floors and, at roof level, an open circular pantheon between 12–17m in breadth. 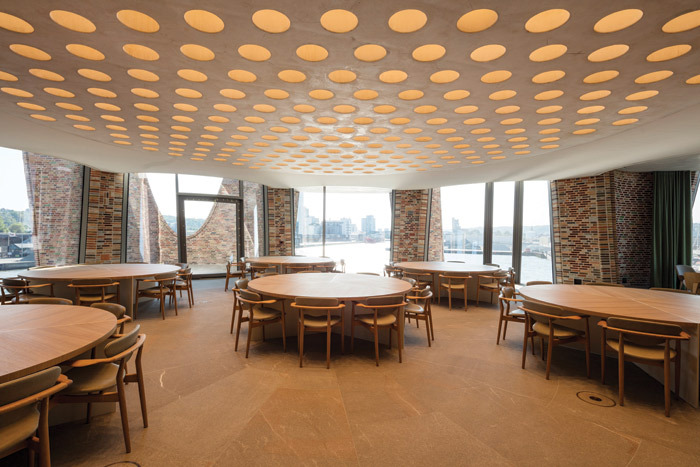 Inside Kirk Kapital’s office rooms, and in the second-floor canteen, Eliasson emphasises the large, circular, elliptical and cornerless tables, ‘for conversation, and breaking bread together. Square tables create a hierarchy’. Above, a lowhanging concrete ceiling features circular perforations to help dampen down sound. Likewise, office and admin storage play with the circular motifs. There are further sumptuous Eliasson artworks hanging at various conspicuous points in the offices, reminders of just how intensely relaxed Eliasson is at working with and for some of the richest people in the world. It left me wishing that this strange, dreamlike one-off had been for something equally dreamlike, rather than the banal reality of wealth-fund offices. There is more than a shade of Louis Kahn’s great Bangladeshi National Assembly Parliament to Fjordenhus, although Vejle is northern light rather than Indian sub-continent heat and dust. The strict geometries found in Dhaka have become Gaudi-esque eyelets, atmospheric ocular windows, and vaulting archways. 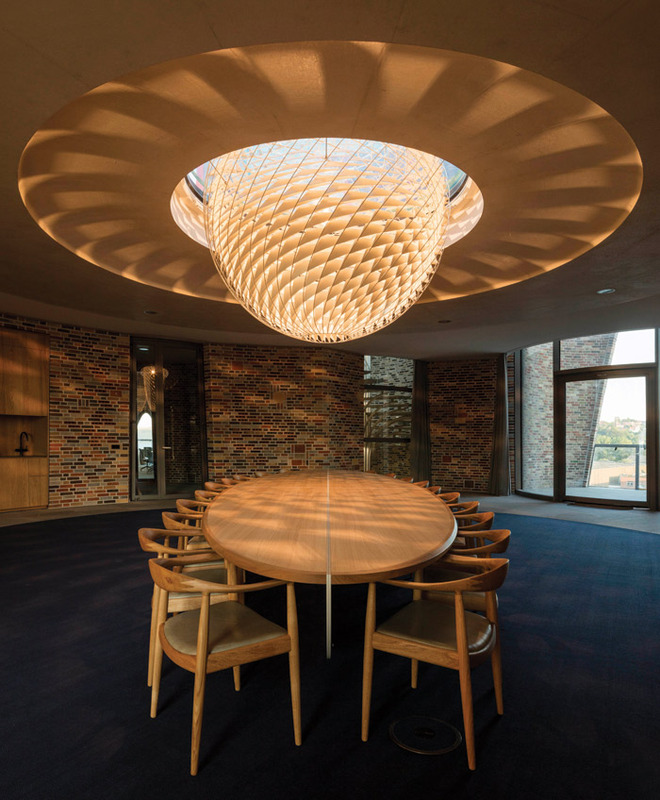 Kahn, Gaudí, Turrell: Eliasson is standing on the shoulders of giants. Born too late to experience live much of this other tradition, the 50-something Icelandic–Danish designer has, for a long time, explored the work of a spectrum of 20th-century heroes, the names of which read like a who’s who of outsider practitioners. Eliasson’s move into architecture has been long coming. To trace Vejle’s Fjordenhus and the studio’s architectural lineage, or at least Eliasson’s first built architectural work, you need to rewind to 2007 when, with Snøhetta, it co-designed that year’s Serpentine Pavilion in London. By then, Eliasson’s studio was finding its feet in new terrain, with its first two real — albeit collaborative — architectural projects: the Harpa conference and music hall on the Reykjavik harbour front, and a ringed walkway, Your Rainbow Panorama, on top of the ARoS Kunstmuseum in the Danish city of Aarhus. Both opened in summer 2011, and both were collaborations with major Danish architectural studios: Copenhagen’s Henning Larsen, and Aarhus’s Schmidt Hammer Lassen Architects, respectively. In 2014, halfway through Fjordenhus, Eliasson and Behmann decided to establish an entirely new entity, the tellingly titled Studio Other Spaces, or SOS. This runs alongside, though separate to, Studio Olafur Eliasson (SOE), with Eliasson and Behmann being actively involved in both. The role of SOS is to work on larger-scale architectural projects; it advertises itself as the ‘architectural counterpart’ to SOE. While Fjordenhus is officially an SOE project — as is last year’s Cirkelbroen cycle bridge in Copenhagen — all of Eliasson’s architectural projects going forward will be under the SOS banner. So far, the studio has pursued two main avenues of geometrical research. There has been the long and fruitful experiment with five-fold symmetry and the quasi-brick research begun after Eliasson’s late-Nineties’ link-up with fellow Icelandic Einar Thorsteinn — a Buckminster Fuller protégé, Frei Otto student and all-round geometer mystic. A legend in Iceland, Thorsteinn (who died in 2015 and is the subject of a Reykjavik’s Design Museum exhibition, Behind the Scenes with Einar Thorsteinn, running until October) was instrumental in bringing geodesics and domes to the country; invited by Eliasson to the Berlin studio, he was given a free hand to continue his geometric experiments. The results would make their way into Harpa’s enormous glass quasi-bricks, based on the mysterious geometric properties of quasi-crystals. There are other SOS projects, including in Ethiopia — where Eliasson teaches at the Alle School of Fine Arts and Design — and Paris. In Paris work is advancing on an architectural installation for the two top floors of the Morland Mixité Capitale building; SOS is part of a team led by David Chipperfield Architects. And in Addis Ababa, the Ethiopian capital, SOS is collaborating with Fasil Giorghis and Vogt Landscape Architects on the ongoing Meles Zenawi Memorial Park project. 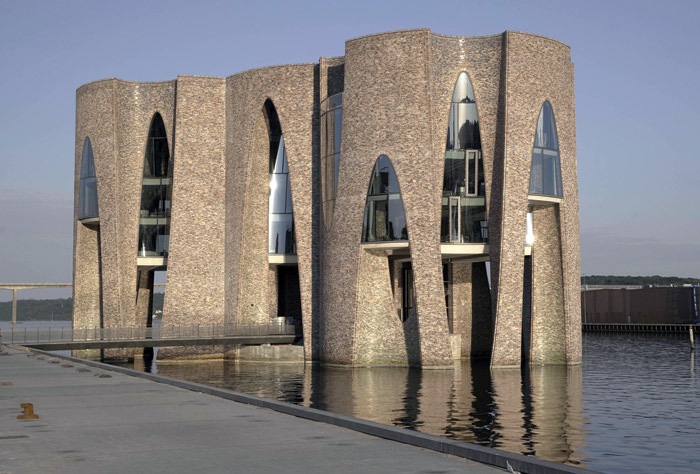 With Fjordenhus, Eliasson has realised another string to the studio’s strikingly diverse bow. ‘It is not just a building with some sculptures being celebrated,’ he says. ‘There are no boundaries. It is not a container; what I hope to suggest is that it is a Gesamtkunstwerk.’ Total Art Work — a rather different proposition to the more usual architectural ambitions, but entirely consistent with the Eliasson experiment; reinventing the 20th-century outsider architecture tradition for the 21st century.